Venus appears to have a rocky surface covered with volcanoes. Measurements of the Venusian atmosphere have shown a recent increase of volcanic gases, suggesting that some of those volcanoes are still active. Volcanic features such as lava plains, channels that look like dry riverbeds, mountains, and medium and large craters can also be found. No small craters exist; this may be because small meteorites cannot penetrate the planet’s thick atmosphere to strike the surface and make a crater. One particularly interesting set of features found on the surface of Venus are called arachnoids. These are circular geological formations ranging from 30 to 140 miles (50 to 220 kilometers) across that are filled with concentric circles and “spokes” extending outward. Maps of Venus made with spacecraft orbiting the planet have shown that, geologically speaking, the Venusian surface is relatively young. Not long ago, lava appears to have erupted from some source and covered the entire planet, giving it a fresh, new face. One piece of evidence that supports this hypothesis is that there are craters and other geologic formations that lack the weathered, worn appearance expected of older features. 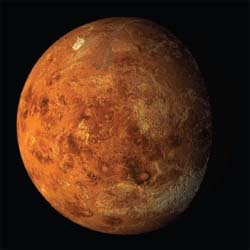 Also, there are surprisingly few craters on Venus for a planet of its size. In fact, more craters can be counted when viewing a section of Earth’s moon through a small telescope than occur on the entire surface of Venus. Astronomers believe the entire surface of Venus was covered over in lava from a fairly recent volcanic eruption.